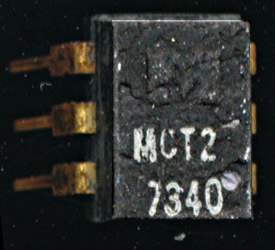 This little chip, dated from 1973, is part of the history of what we are surrounded by, LEDs. And they have an unlikely and somewhat surprising beginning. 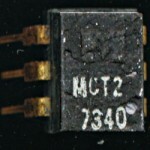 The MCT2 is an opto-coupler, basically an LED and a phototransistor in a single package, used for isolating digital signals. The important portion here is the LED. LEDs are in nearly every electronic product these days, and this Christmas season we see many Christmas lights that are now LED based. THey are more efficient, and much longer lasting. Certainly the eco-friendly choice for lighting. And they have their roots in a company that does not always elicit an eco-friendly discussion. That big ‘M’ on the package is for Monsanto, who from 1968-1979 was the leading supplier of LEDs and opto-electronics. In 1968 there were exactly 2 companies who made visible light LEDs (red), HP and Monsanto, and HP used materials supplied by Monsanto to make theirs.